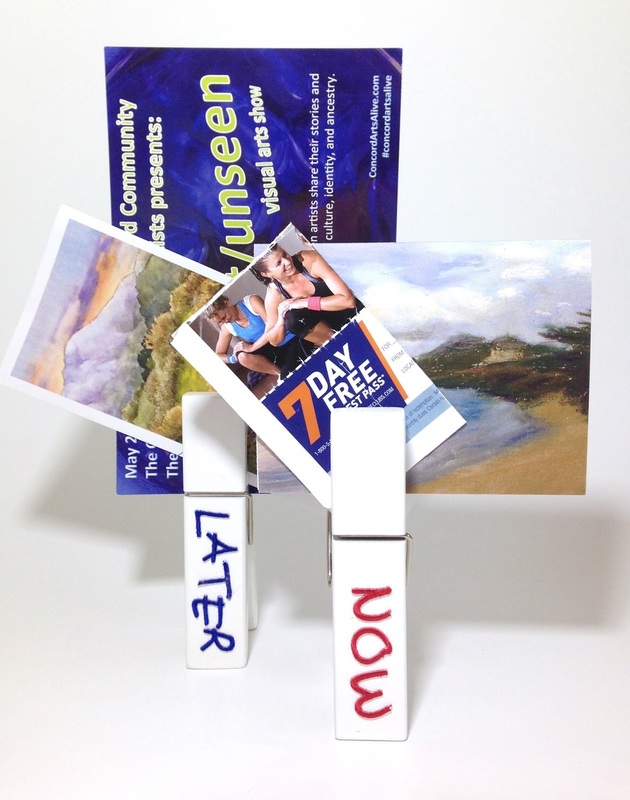 I love this giant wood clothespins for holding photos, but I realized they'd be perfect for holding mail, notes, coupons and other papers I need to keep track of. To keep my organizing tactics simple, I labeled them "now" and "later" by gluing on Joy embroidered letters. Pretty cute, too! 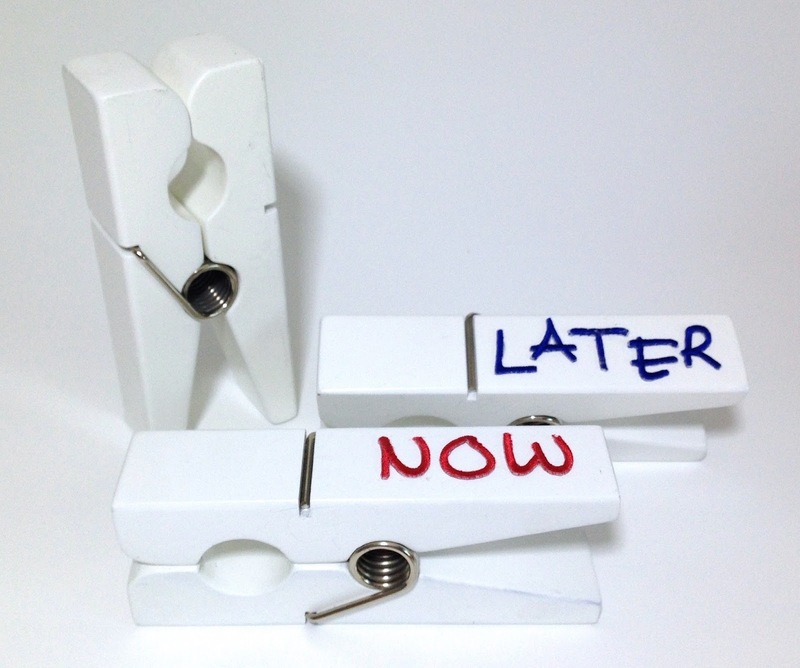 Now I can keep all the loose papers and cards together in one place - these clips can either stand up or lay flat on the table. They can hold about 1/2" thickness, so all the stuff I need to deal with now versus the things I can read through later will fit into two neatly organized clips. I love the ocean, but I don't see much of it here in Texas. 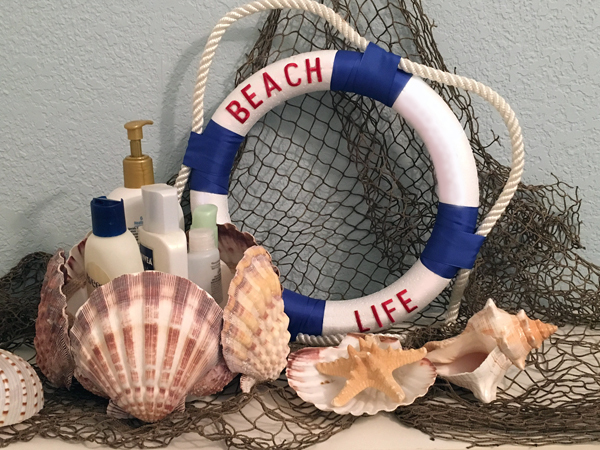 However, when one of the bathrooms needed a a facelift, I decided to get nautical..... a lifesaver seemed like a good place to start. 1. The wreath is divided into 12 sections by markings on the surface of the Smoothfoam, so no measuring required. Wrap the ribbon around every third section. Pin the end of the ribbon in place at the back with a quilt pin. 2. 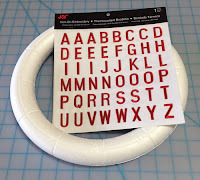 Select the letters needed then glue in place in the open sections of the wreath as shown. 3. Pin the end of the rope onto the first blue section then lay it around the outside of the wreath. 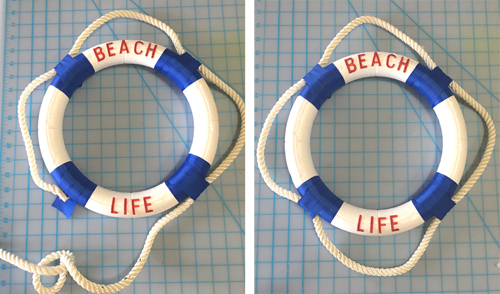 Secure at each blue section by unpinning the end of the ribbon then wrapping it over the rope. Re-pin the end of the ribbon at the back. Add glue if desired. Trim the end of the rope as needed. JOY embroidered letters can be found in a variety of sizes, fonts and colors in the sewing/notions department at your favorite craft store. 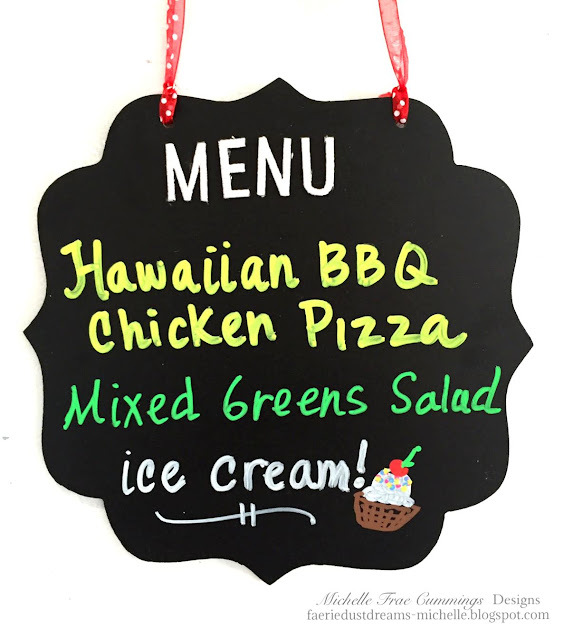 This reversible chalkboard menu sign starts off welcoming your guests at the front door, then you just flip it over to show off your dinner party menu. The great thing about JOY embroidered letters is how versatile they are! 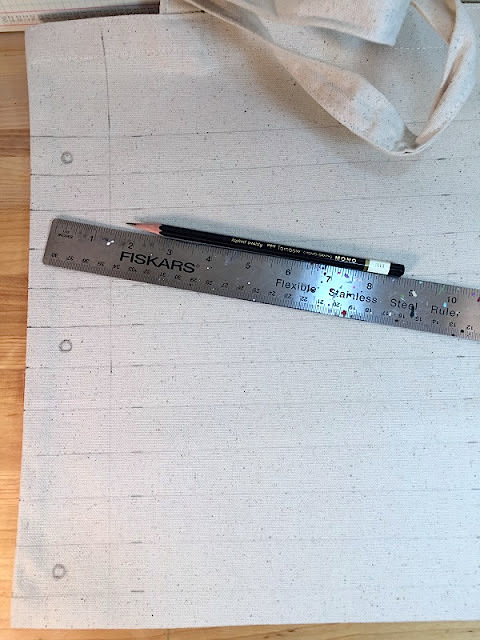 Use them to add texture and dimension to any surface - fabric, paper, wood and more. 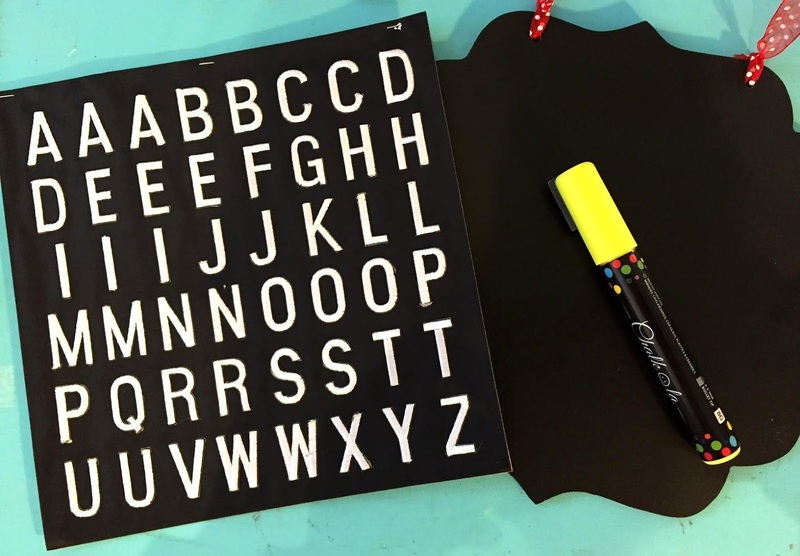 Start with a ready-made reversible chalkboard sign from the craft store. 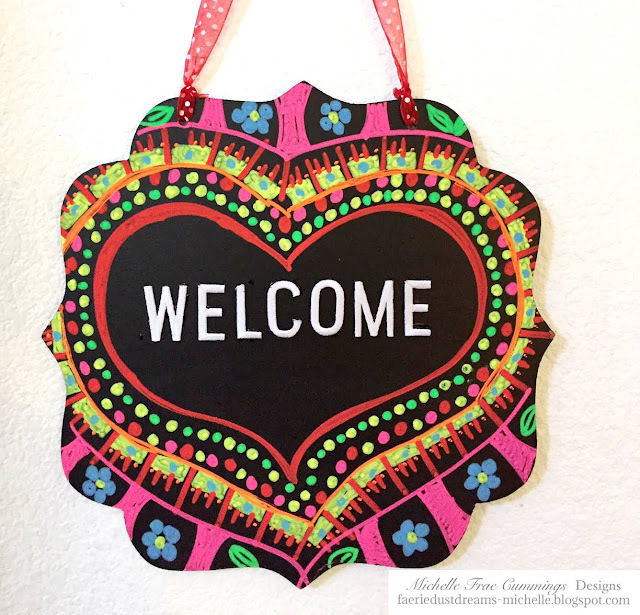 Glue the letters for "MENU" to the top of one side, and the word "WELCOME" to the center of the back side. Doodle a cute design around your welcome and then write in your menu selection with bright chalkboard markers. See even more JOY inspiration here on our Facebook page! It's so easy to personalize a headband for your baby with Joy iron-on embroidered letters! This one is for my youngest granddaughter who is turning one in just a few days. 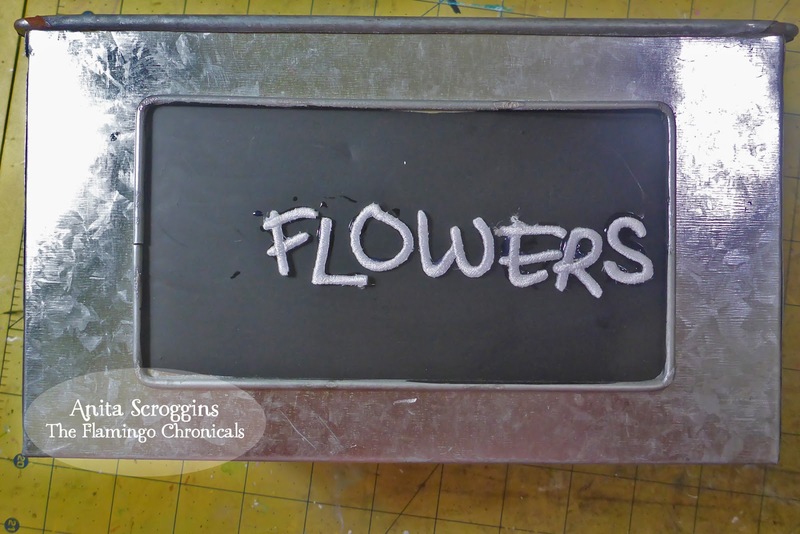 Die-cut or trim some different sized flowers from your favorite scraps felt or fabric. 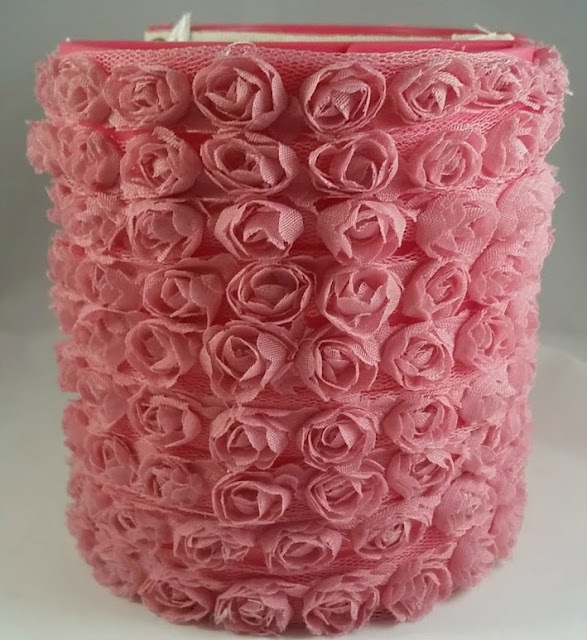 Follow the package directions to iron a letter on to the top flower, then layer the flowers together and secure with a couple stitches, then sew the flowers to the end of a length of ruffle elastic to fit the baby's head comfortably. Add a few more stitches to attach the ends of the elastic together. Enjoy! Summer is almost here, which means it's time for weddings, graduations, and lots of outdoor parties. These personalized nature-inspired place cards will bring a simple sophistication to any table. 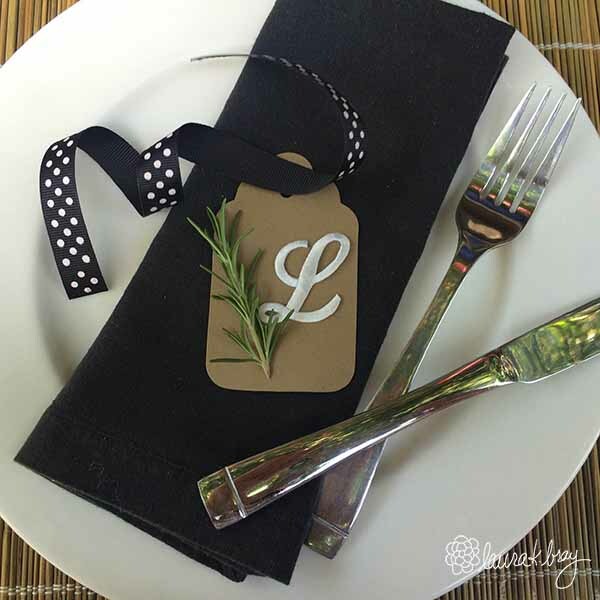 These place cards are easy to make, plus they double as a napkin ring and a take-home party favor, too! 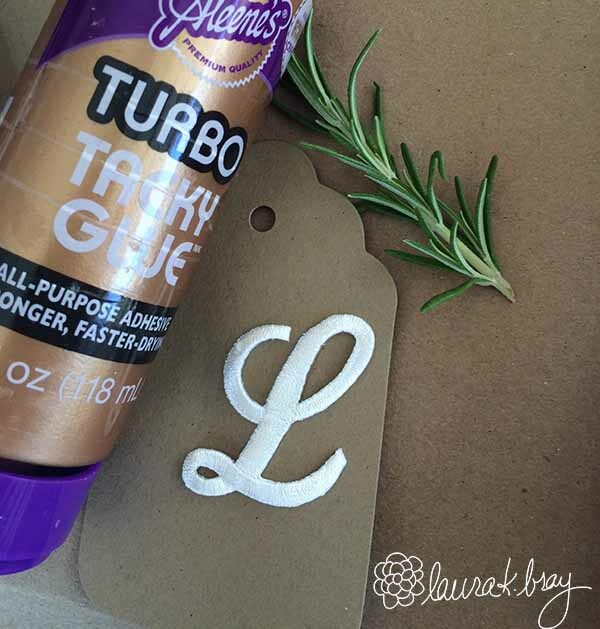 Glue a Joy embroidered letter as a monogram on a cardstock tag for each guest, then glue a stem of rosemary onto the tag. Pull a beautiful ribbon through the tag and tie it around a napkin to complete the look. The rosemary will add a lovely scent to your table setting. This project can also be used for gift tags or try using numbers instead of letters for seating tags at a wedding reception. 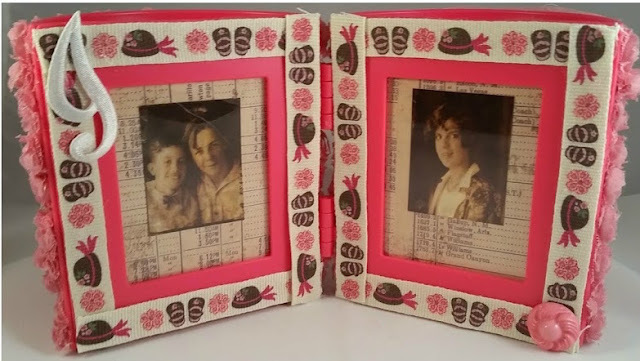 Come and see what else I'm making for the summer over on my blog! 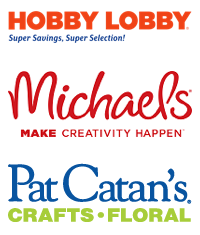 Look for Joy embroidered letters in a variety of sizes, fonts and colors at your local craft store! May is Teacher Appreciation Month, so I have created this cute book bag inspired by notebook paper for that special teacher! 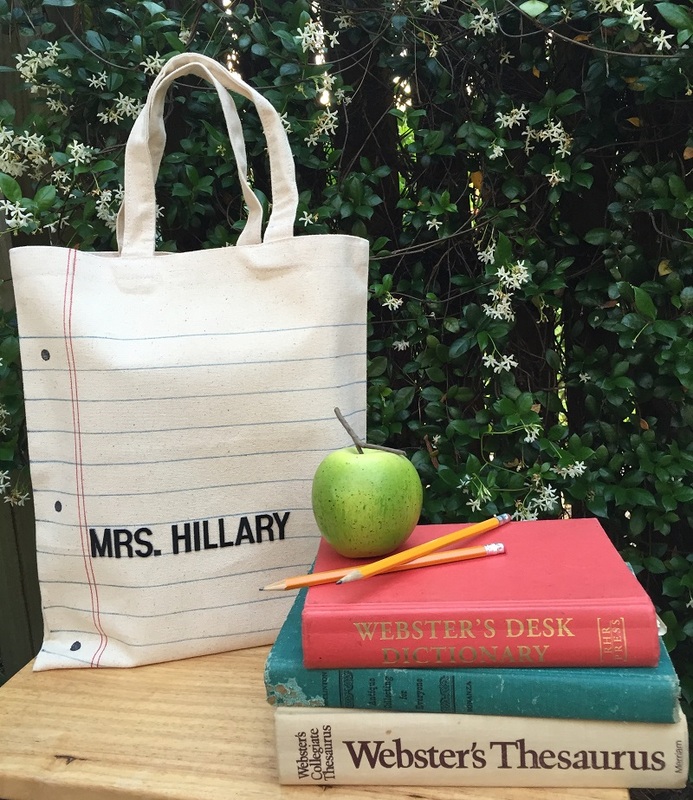 Shout-out to Mrs. Hillary at Burns Middle School in Brandon, Florida! 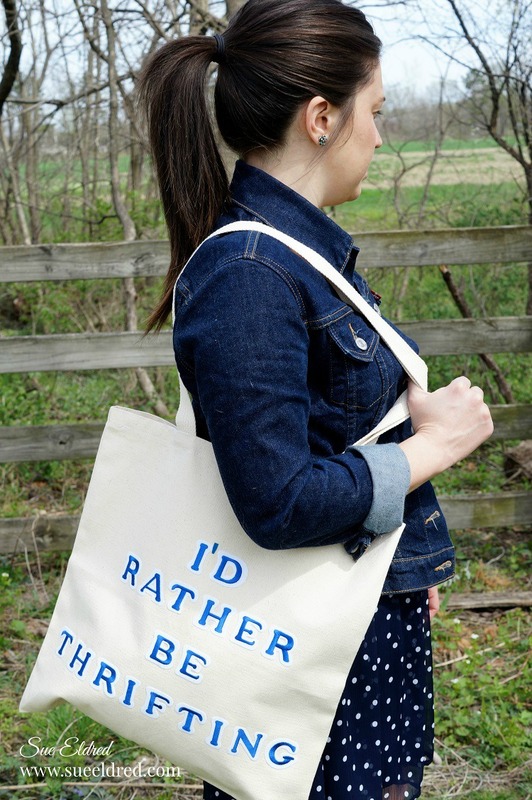 Start with a plain canvas tote bag - mine is 16" square from Canvas Corp Brands. Measure and draw horizontal lines across the width with a pencil - I started 3" from the top with the lines in 1" increments. Mark two vertical margin lines at 1/4" apart, 2" in from the left side. To make the binder holes on the left, draw a small circle at the first line, a middle line and the last line. Trace over all the pencil marks with fine-point permanent markers - red for the margin lines, blue for the writing lines, and black for the binder holes. 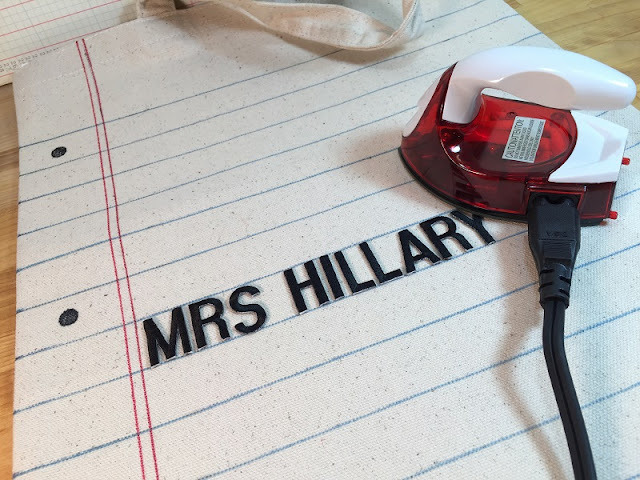 Spell out your favorite teacher's name with Joy iron-on embroidered letters. Iron them on according to the package directions. I like to use a flat craft iron without steam holes for better adhesion. Fill your Teacher Appreciation Book Bag with great BOOKS (of course) and give it to that special teacher! Be sure to check out the JOY Facebook page for even more inspiration. A plastic hinged pencil cup from the office supply store may not seem like a very nice DIY gift, but glue on some organza floral trim, vintage buttons, photos and a JOY embroidered letter - and now you have a personalized, shabby chic pencil cup that will take a place of pride on any counter or desk! My daughter is an expert at shopping the thrift stores and finding a great deal. 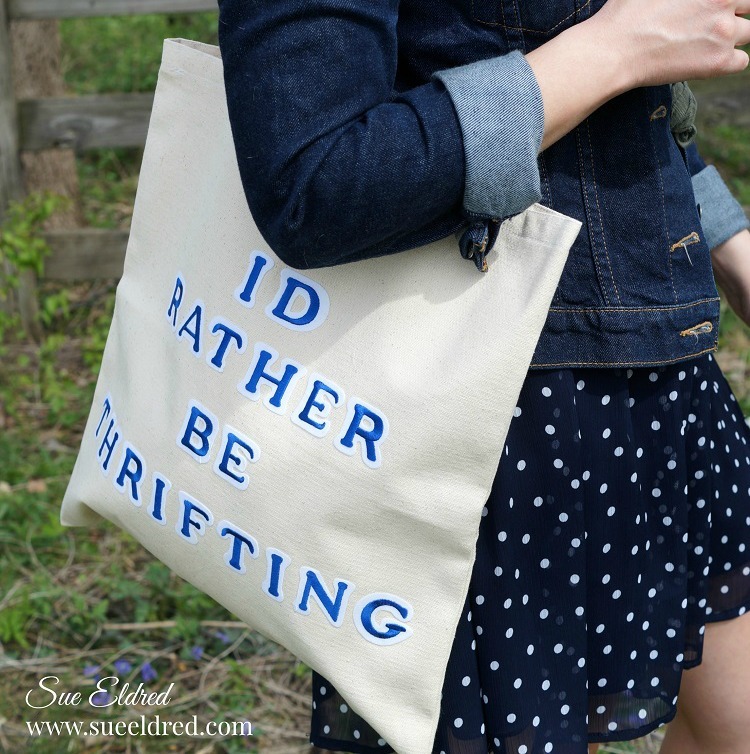 When she asked me to make her a tote bag similar to the ones she'd seen online, I knew exactly where to start. I found a large, plain canvas bag and ironed on a fun saying with Joy embroidered letters. 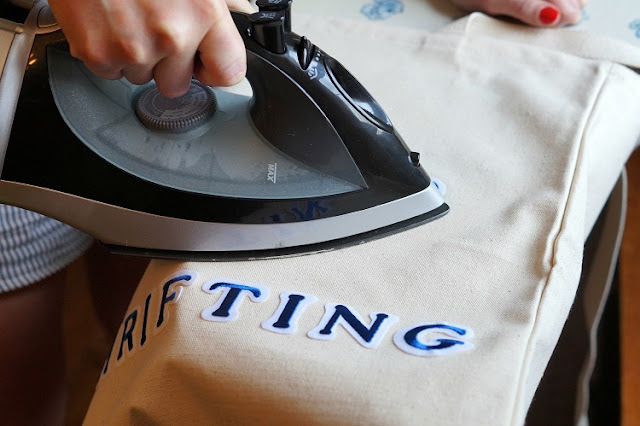 It's quick and easy - just preheat your iron to the cotton setting, then remove the paper liner on back of each letter (exposing the temporary adhesive) and press into place on your tote bag to spell out your quote. Cover the letters with a cotton cloth and iron for about 30 seconds. I ironed it again from the back of the fabric for another 30 seconds. What is a wedding without sweets, right? 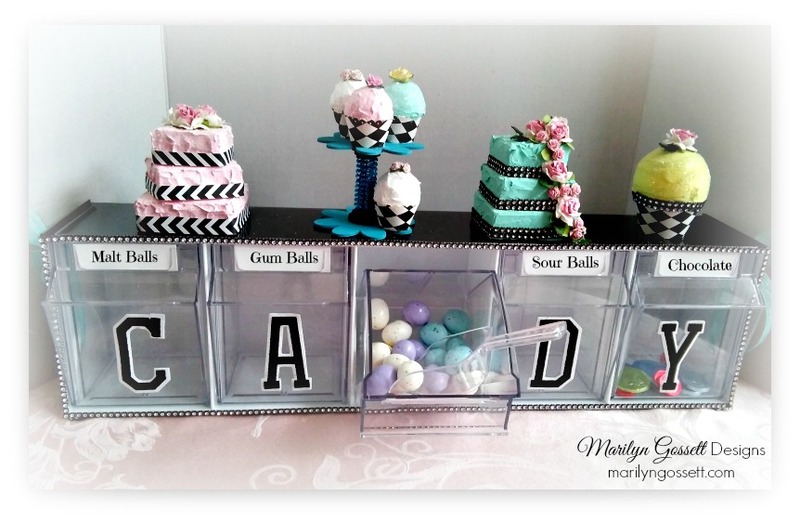 While planning the décor for a family wedding, I had this great idea for using Deflecto Craft Tilt storage bins to serve up treats for the guests. The "stars" of this project are the large Joy embroidered letters that I used on the front of the bins. The letters have an adhesive on the back side that is meant to be temporary, as the real adhesive is heat-activated. 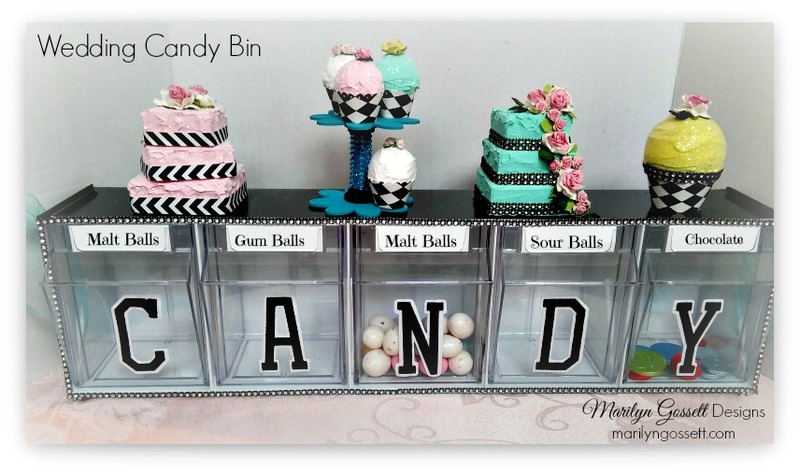 In this project, I removed the release paper from each letter and applied one to each bin to spell "CANDY." You should be able to remove the letters easily after the wedding to use the bins for storage. Click here to see how I made the mini faux cakes on top of the candy bin! Spring is still in the air here in North Texas and I love having fresh flowers in the house. 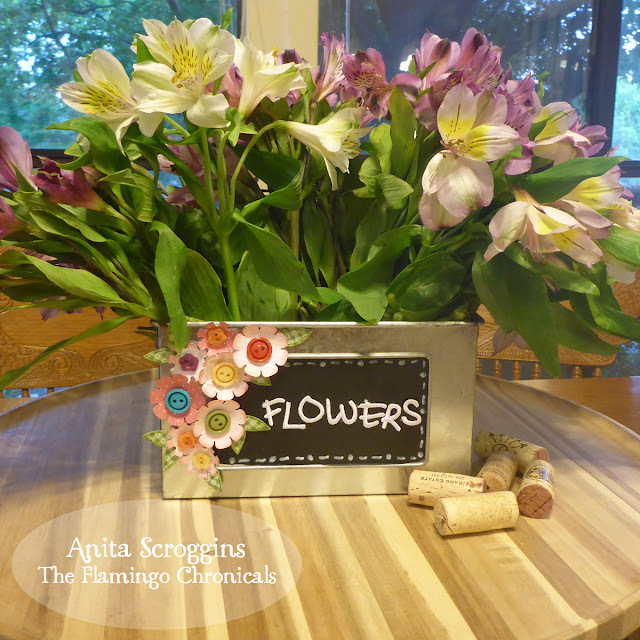 I generally have flowers in every room, so I am always on the lookout for new ways to display them. I picked up these little metal bins at Michael's a while back and I have been looking for something to use them for. I added some Joy Embroidered Letters along with some fun embellishments and BAM! Hello new flower pot! I started with the container, a set of flower die-cuts, some glue and the Joy letters. 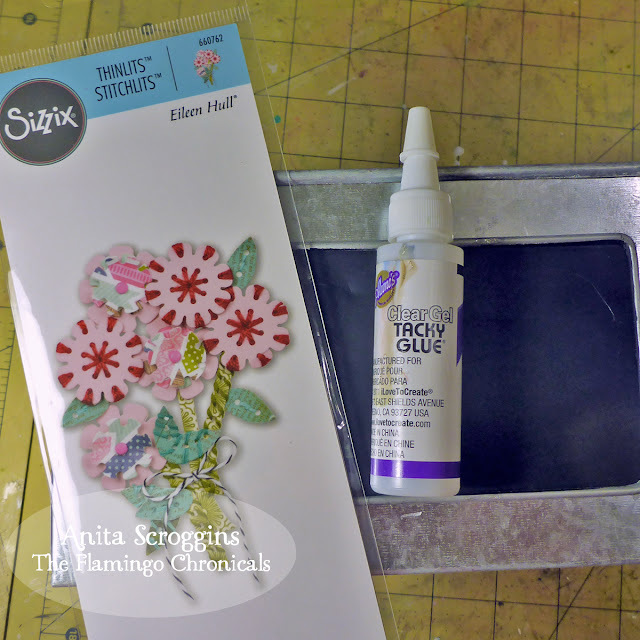 Then I die-cut a variety of flowers and leaves and layered them on the left side, then added some border lines with a white chalk pen. 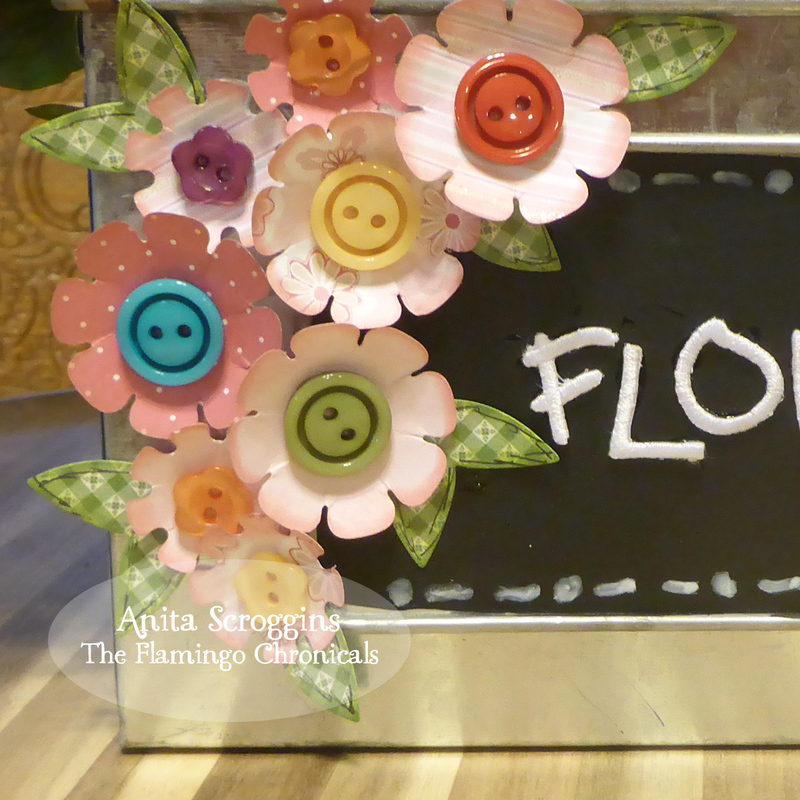 I love the way my flower bin turned out - and I love the fact that I was able to use an empty container that was just taking up space in my studio!